Diverse forms of art are the way Inuit have been telling their stories, from the creation of all life itself to everyday existence, since the times of their ancestors to this very day. 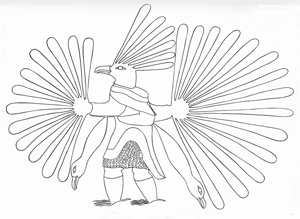 Song and dance; stone, bone and ivory carvings; felt and bead adorned wall hangings; clothes and doll making; pen and ink drawings, paintings; string games and hand shadow puppets; films and of course print making are all art forms which have been used to describe the Inuit world, their universe. 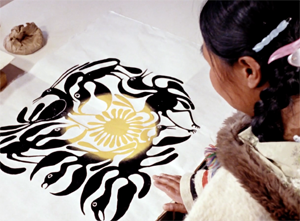 The National Film Board of Canada has described on their blog site a collection of seven films about Inuit and their art. The first one on their list is about the life of Kenojuak Ashevak (1927-2013). It stars the young woman who would become a world renown printmaker. While there is some Inuktitut dialogue, Ashevak’s own thoughts are narrated in English by Alma Houston, who, with her husband James, was instrumental in introducing Inuit art to the rest of the world. 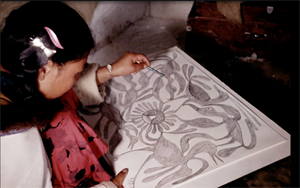 In this 1963 Oscar nominated (Short Subject category) documentary, Ashevak describes her sources of inspiration that motivate her to put images on paper: her surroundings, every day activities, her interpretation of the Creation, “stories gathered from thousands of winters and summers.” From inspiration to final product, the entire process is shown. An original design is drawn. 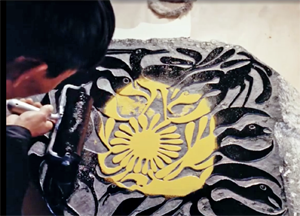 men painstakingly cut the intricate pattern into the stone. and then carefully rolled across the now raised image. and then lifted off to reveal a “shadow print”, as Ashevak called it. Viewers also get to witness some of the sources of Ashevak’s creativity as well as her life on the land in snow houses, travel by dog team and scenes from Cape Dorset, now called Kinngait. 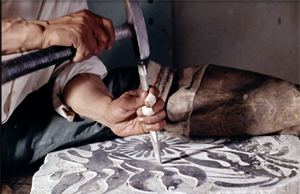 Eskimo Artist Kenojuak Ashevak, twenty-minutes long and in color, and the other six documentaries about Inuit artists are, thanks to the National Film Board of Canada, free for anyone to watch here. Now you can try your hand at Inuit art, without having to do it from scratch. 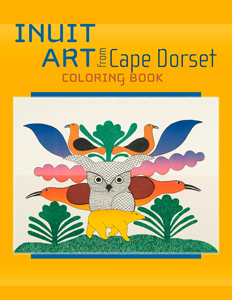 The Inuit Art from Cape Dorset Coloring Book contains blank line drawings by ten Inuit artists, each titled and dated. Twenty-two in all, seven of them of them are the work of Kenojuak Ashevak. On the inside front and back covers are the actual color renditions, in case a little extra inspiration is needed. Each image is on its own page with nothing on the opposite side, making it able to be framed. The Inuit Art from Cape Dorset Coloring Book, catalog #CB101, ISBN 978-0-7649-5022-3, is an 8.5” x 11” paper back manufactured by Pomegranate Communications, Inc. It can be purchased directly from Pomegranate for $7.95 US or from Amazon and other booksellers. Also available from Pomegranate is a gorgeous Cape Dorset Inuit Art wall calendar printed on heavy-duty paper. Each month displays a 12” x 13” full color, fully described print featuring the work of a variety of talented artists. If you typically make notations within the generously sized day boxes, you’ll want to do that carefully as each picture is on the back side and is suitable for framing; not as nice or as big as owning a limited edition print made right from an original stone cutting, but still lovely.